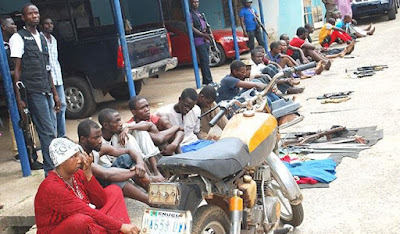 Parading the suspects at the command headquarters, the state police commissioner, Sanusi Lemu, warned criminals operating in the state to desist saying they will soon be flushed out of the state. Lemu said the command recovered various weapons and items from the suspects. It includes AK-47 rifle, 2 AK-47 empty magazines, 2 locally fabricated AK-47 rifles, 2 SMG rifle, 1 Barreta Pistol, 1 SMG fabricated rifle, 1 locally made Revolver Pistol, 130 rounds of live ammunition of different caliber and others.